How to Set Up your Own Personal Wiki. Initially, this is going to be a guide for myself and my hacker friends to set up their own wiki. Eventually this will become a friendly guide that anyone should be able to use. If you'd like to help with this project, please send email to <wiki-instructions@aurellem.org>. Last time I showed you how to set up your own server running Arch GNU/Linux. Today we're going to build off of that and make our own wiki, just like Wikipedia! Is a set of programs and files on your server that stores data in a highly ordered way and provides fast access to the data. The data is often arranged in a structure called a Table. Individual entries in the table are called Records or Rows. Programs are able to create Tables and Records in similar ways to how they create files. Like files, Tables have specific owners and permissions, so that only certain users and programs are able to access them. The important difference between a Table and a file is that a Table enforces constraints on the information inside it. A Wiki program might have many different tables in the database : one for handling users and passwords, one for handling the content of the wiki pages, and still another for handling administrative settings for the wiki as a whole. MySQL (http://www.mysql.com/), postgreSQL (http://www.postgresql.org/) and MongoDB (http://www.mongodb.org/) are all examples of database programs. We will be using MariaDB (a version of MySQL) for our media wiki installation because that is what Wikipedia uses. This is a set of programs that access the database and generate the HTML that will be delivered for any given page on the Wiki. These programs also write to the database whenever a page needs to be updated. Wiki software often includes images and CSS stylesheets to give a Wiki a basic style as well. 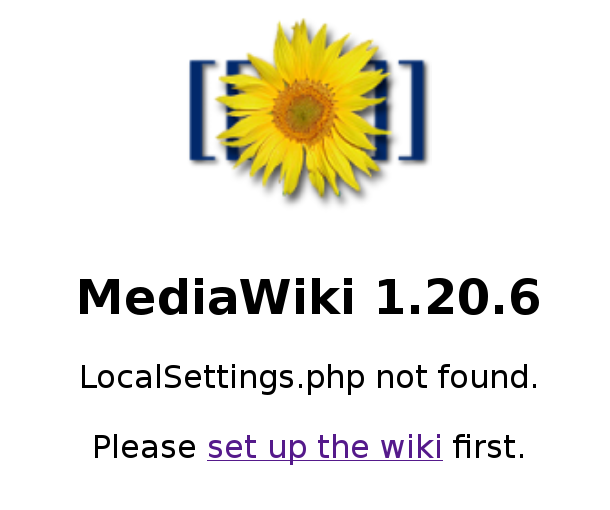 We'll be using MediaWiki (http://www.mediawiki.org/wiki/MediaWiki) for our Wiki Software. A web server is like an email server in that it is always listening for input. An email server listens for emails, and a web server listens for people requesting a page. Your web server is the guardian and lens through which you present information from your server to the Web. It takes requests for pages such as http://aurellem.org/dl/constitution.txt and returns information depending on how you have configured it. You can configure a Web Server to do just about anything in response to a request for a page. A basic setup involves simply serving a folder of files from your computer to the world, and giving a 404 error if someone requests something that isn't there. In our case, we will configure the Web Server to accept addresses like http://wiki.aurellem.org/index.php?title=Main_Page and request the Wiki Software to generate HTML appropriate for that address. You can configure a Web Server to run any program to generate responses to page requests, even one you write yourself! Whenever you visit a page on the internet, you can be sure that you are interacting with a Web Server program running on a computer connected to the internet. We will be using lighttpd (http://www.lighttpd.net/) because is is easy to configure. Other web servers include Apache (http://httpd.apache.org/) and Nginx (http://wiki.nginx.org/Main). Now you will get yourself your own personal server and your own domain, both of which are required for running a public wiki. If you already have a domain name and a server, or if you just want to configure a wiki for use on your own computer only, skip down to the "Install MySQL" section. 5 Link your domain name with your new server. 6 Configure A records for your machine to create a "wiki" subdomain. The point of this section is to create the "wiki.<your-domain-name>" domain. I like this setup for aesthetic reasons because it keeps your domain name open for other services you might install in the future, such as webmail at "email.<your-domain-name>" or an FTP server at "ftp.<your-domain-name>". If you want your new domain name to serve as a wiki exclusively, feel free to adjust these directions accordingly. On my system visiting http://wiki.aurellem.org/ will bring you to the wiki, while http://aurellem.org/ will take you to this blog. 2.) Click "Add a domain zone" at the bottom right corner of the screen and enter the following values. Select "Yes, insert a few records to get me started", using the default IP suggested. 3.) Delete the "mail" A Record, the "www" A Record, and the "mail.<your-domain>" MX Record. (This is not strictly necessary, I just like to keep the records clean). 7 Set up your new sever. Tell systemd to start MySQL when the system starts. MySQL is like a file system, and just like the filesystem on your server, MySQL needs to have a root user that can access everything and create new users. It is talking about the root user for the MySQL system, NOT the root user for your server. You should just press enter and not enter the password for the root user on your system. Select "Y" and create a new password for the root MySQL user. As with all passwords, I recommend that you set the root password on your MySQL database to a passphrase that is easy for you to remember but hard for anyone to guess. Four random English words such as "meticulous cougars flavorsome waltzing" should work very well and be essentially impossible to break. (Don't actually use "meticulous cougars flavorsome waltzing" now that I've written it here.) You should avoid using the same password for both your root server account and your MySQL account so that if someone compromises your wiki, they don't also get access to your server. Be sure to remember this root password as you will need it later to set up your wiki! Select "Y" for the rest of the options to remove unnecessary database elements created when MySQL was installed. Now, restart MySQL for your changes to take effect. Make sure that it says "Active: active (running)". 10 Install php, a "programming language". These programs provide the php language as well as several helper programs needed for our mediawiki. php is controlled by a global config file called php.ini. This file specifies which capabilities the php language will have on your system. Since we're setting up a wiki, we'll need to enable graphics, mysql, and a few other capabilities. Locate the "Dynamic Extensions" section of /etc/php/php.ini. ; in its default extension directory. 12 Install MediaWiki software and related files. Choose a directory on your system that will serve as the base directory for your system. On my system, my user is called r, and I use /home/r/wiki/aurellem to serve http://wiki.aurellem.org/. Other wikis I host get their own directory in /home/r/wiki. If your domain was lolcatsforever.com and your username on your server was catz, you might consider using /home/catz/wiki/lolcatsforever as the base folder for the wiki at http://wiki.lolcatsforever.com/. Whatever you pick is entirely your choice, and from now on I'll refer to the directory you chose as <wiki-base>. You will now need to create <wiki-base> and link some files to prepare your wiki. This creates symlinks from the files you installed from the mediawiki package to your <wiki-base>. You create symlinks instead of copying the files so that whenever you upgrade mediawiki, the files for all of your wikis will be updated as well. You remove the symlink to /usr/share/webapps/mediawik/images and replace it with a folder of the same name because mediawiki stores images related to a wiki in the images folder and thus each wiki needs its own images folder. The chown and chmod commands enable lighttpd to access the images folder an put images into it whenever someone uploads an image to your wiki. 13 Install lighttpd, a powerful Web Server. Instruct systemd to start lighttpd on boot. The config file for lighttpd is the most complicated file to prepare because lighttpd can do so many different things. Be sure to replace <your-domain> and <wiki-base> above with the appropriate values for your system. To confirm that lighttpd is still running. Now you can visit http://wiki/.<your-domain> and configure your new wiki. You should be greeted with something that looks like this. Figure 1: Your new Wiki awaits. Click and follow the on screen directions. Below are the settings I used on for my own wiki. Modify yours accordingly. The configuration will end by offering you a file called LocalSettings.php. Notice that the initial "/" is required. Congratulations! You have a shiny new wiki that your and your friends can edit and use to collaborate. Here are a few commands that you can use to examine your new system. You can also check /var/log/lighttpd/error.log for useful information. If you can't access your wiki at all for some reason, these are the first things to check. You can use the terminal to access your MySQL database and examine the tables and records there. Here's an example session of me interacting with my server. At this point I went to http://wiki.aurellem.org/ and created a new user named "new-user". Then in this same SQL session I executed the select command again. Notice how the users table changes when I add a new user to the wiki! You can always check the images you and others have uploaded by going to <wiki-base>/images and running tree. If you don't have the program tree, install it with. You can delete images for good by going to the images directory and removing them. Disks fail, companies go out of business, and you may be hacked at some point, so you should know how to backup your wiki and also how to restore it from the backup. In contrast to normal files, in order to backup your wiki you have to use a specialized MySQL "data dumper" to get the information contained in your MySQL database. The backup file is a human readable sequence of SQL statements that together restores the wiki's tables when executed. Take a look at it – it's quite interesting. You can only run this command from your server, but once you have generated the backup file, you should copy it to another location to protect from the possibility of your server being destroyed. To restore your wiki after a catastrophic failure, run the following commands. First, an empty database with the same name as your wiki database. Your wiki database will be restored. Now that you've created one wiki, creating another one can be done in 5 minutes or less. Here are the steps. For the purposes of this we'll use wiki.new-site.org. 20.2 Decide on a directory to serve as the base for your new wiki. 20.5 Complete wiki configuration from your browser.